Ongoing cooperative cleanup and natural resource damage restoration effort at polluted harbor in Portland, Oregon. U.S. Supreme Court held Tribe/United States owned Lake Coeur d’Alene and St. Joe River within Coeur d’Alene Reservation against State. Idaho v. U.S. and Coeur d’Alene Tribe, 533 U.S. 262 (2001), 210 F.3d 1067 (9th Cir. 2000) (Won), 95 F. Supp.2d 1094 (D. Idaho 1998) (Won). Court held Eleventh Amendment barred Federal Court jurisdiction over State officials regarding claim for ownership of submerged lands. Idaho, et al. v. Coeur d’Alene Tribe, 521 U.S. 261 (1997), 42 F.3d 1244 (1994) (Won); 798 F. Supp. 1443 (1992) (Lost). Court confirmed plan that paid $20+ million of bankrupt’s assets to United States and Tribe for Coeur d’Alene Basin cleanup. Gulf Resources Bankruptcy, U.S. Bankruptcy Ct. Idaho (1995). Ongoing litigation and administrative effort and cleanup and restore natural resource injury and cold war plutonium Pollutant Production Facility in South Central Washington, largest superfund site in the United States. Court halted abandonment (salvage) of Plummer-Mullen rail line until ICC completed EIS. Eventually settled case by UP cleaning up pollution and paying for installing maintenance of bike trail ($25 million), and conveying trail interest to Tribe and State (partner negotiated). In re Union Pacific Abandonment, 35 F.3d 585 (1994). Court allowed people to vote on Tribes’ Indian Gaming Initiative - dismiss lawsuit to remove Initiative from ballot. Noh v. Cenarrusa and Stensgar, ____ P.3d ____ (Idaho 2002). Court upheld Tribe’s right to conduct interstate National Indian Lottery from Reservation. AT&T v. Coeur d’Alene Tribe, 295 F.3d 899 (9th Cir. 2002). Court allowed removal to federal court of Internet Indian gaming case where only State claims pled. Case eventually settled. Nixon v. Coeur d’Alene Tribe, et al., 164 F.3d 1102 (8th Cir. 1999). Court limited issues negotiable in Indian gaming compact, following similar 9th Cir. case decided two weeks before argument. Coeur d’Alene Tribe v. Idaho, 51 F.3d 876 (9th Cir. 1995), 842 F. Supp. 1268 (D. Idaho 1994). Court held State cannot tax fuel sold by tribal and individually owned stations because amended state statute still placed incidence of tax on tribal retailer. Coeur d’Alene Tribe v. Hammond, 2002 WL 31115066 (D. Idaho) (associate argued). State Tax Commission abandoned its staff’s efforts to tax materials used by tribal contractors and subcontractors on tribal casino construction. Court held State could not tax any gas sold at tribal gas stations because incidence of fuel tax on tribal gas stations, a position urged by Tribal amicus but not advocated by either of the other parties. Created claim for large refund. Goodman Oil v. State Tax Comm’n, 136 Idaho 53, 28 P.3d 996 (2001). United States confessed error on $200,000 administrative claim against Tribe and paid Tribe $100,000 plus $30,000 attorney fees. Coeur d’Alene Tribe v. U.S. Dept. of Agriculture, U.S. D.Ct. (1996). Automobile accident personal injury case. Former county sheriff paid tribal member just under $1 million. Aripa v. Watson, Coeur d’Alene Tribal Court & Idaho State Court (1995). Court stopped unlawful eviction of client. Post Falls Trailer Park v. Fredekind, 962 P.2d 1018 (Idaho 1998). Client received marina encroachment permit previously issued to neighboring lumber mill for log storage. Templin v. State, Louisiana Pacific, Washington Water Power, 1986. Court voided Idaho Legislature’s 1982 reapportionment plan, adopted plan proposed by client and awarded client over $100,000 in attorney fees. Client garnished sales tax collected by Albertsons when State refused to pay attorney fees. Hellar v. Cenarrusa I, II, III, 664 P.2d 765 (Idaho 1983), 682 P.2d 539 (Idaho 1984), 682 P.2d 524 (Idaho 1984). Suit against smelter for lead poisoning of children in Coeur d’Alene Basin. Settled for $1+ million for each primary client. 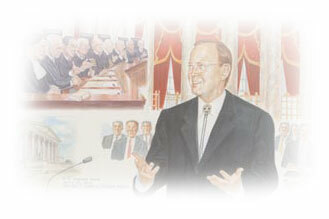 Wilson v. Gulf Resources, U.S. D.Ct. Idaho 1984. Utility - Idaho Power v. Idaho Public Utilities Commission, 102 Idaho 744, 639 P.2d 442 (1981) (Lost - PUC could not award attorney fees to consumer group - resulted from PURPA proceedings). Access to Courts - Graves v. Cogswell, 522 P.2d 224 (Idaho 1976) (Won - Court ordered District Court to waive filing fees for indigent litigant).